Programme Management may be defined as ‘The coordinated management of a group of related projects to ensure the best use of resources in delivering the projects to the specified time, cost, and quality/performance criteria’. A number of organizations and authorities have coined different definitions, but the operative word in any definition is related. Unless the various projects are related to a common objective, the collection of projects would be termed a ‘portfolio’ rather than a ‘programme’. A programme manager could, therefore, be defined as ‘The individual to whom responsibility has been assigned for the overall management of the time, cost, and performance aspects of a group of related projects and the motivation of those involved’. Again, different organizations have different definitions for the role of the programme manager or portfolio manager. In some companies, he or she would be called manager of projects or operations manager or operations director, etc., but it is generally understood that the programme manager’s role is to coordinate the individual projects that are linked to a common objective. Whatever the definition, it is the programme manager who has the overall picture of the organization’s project commitments. Many organizations carrying out a number of projects have limited resources. It is the responsibility of the programme manager to allocate these resources in the most cost-effective manner, taking into consideration the various project milestones and deadlines as well as the usual cost restrictions. It is the programme manager who may have to obtain further authority to engage any external resources as necessary and decide on their disposition. As an example, the construction of a large cruise ship would be run by a programme manager who coordinates the many (often very large) projects such as the ship’s hull, propulsion system, and engines, control systems, catering system, interior design, etc. One of the associated projects might even include recruitment and training of the crew. A manager responsible for diverse projects such as the design, supply, and installation of a computerized supermarket check-out and stock control system, an electronic scoreboard for a cricket ground, or a cheque-handling system for a bank, would be a portfolio manager, because although all the projects require computer systems, they are for different clients at different locations and are independent of each other. Despite this diversity of the projects, the portfolio manager, like the project manager, still has the responsibility to set priorities, maximize the efficient use of the organization’s resources, and monitor and control the costs, schedule, and performance of each project. In a client type of organization, the projects or programmes will probably not be the main source of income and may well constitute or require a major change in the management structure and culture. New resources may have to be found and managers involved in the normal running of the business may have to be consulted, educated, and finally convinced of the virtues, not only of the project itself but also of the way it has to be managed. The programme manager in such an organization has to ensure that the project fits into the corporate strategy and meets the organization’s objectives. He or she has to ensure that established project management procedures, starting with the business case through implementation, and ending with disposal, are correctly employed. In other words, the full life cycle systems using all the ‘soft’ techniques to create a project environment have to be in place in an organization that may well be set up for ‘business-as-usual’, employing only well-established line management techniques. In addition, the programme manager has to monitor all projects to ensure that they meet the strategic objectives of the organization as well as fulfilling the more obvious requirements of being performed safely, minimizing and controlling risks, and meeting the cost, time, and performance criteria for every project. Programme management can, however, mean more than coordinating a number of related projects. The prioritization of the projects themselves, not just the required resources, can be a function of programme management. It is the programme manager who decides which project, or which type of project, is the best investment and which one is the most cost-effective one to start. It may even be advantageous to merge two or more small projects into one larger project, if they have sufficient synergy or if certain resources or facilities can be shared. Another function of programme management is to monitor the performance of the projects that are part of the programme and check that the expected deliverables have produced the specified benefits, whether to the parent organization or the client. This could take several days or months depending on the project, but unless it is possible to measure these benefits, it is not possible to assess the success of the project or indeed say whether the whole exercise was worthwhile. It can be seen therefore that it is just as important for the programme manager to set up the monitoring and close-out reporting system for the end of a project as the planning and control systems for the start. In a contracting organization, such a culture change will either not be necessary, as the organization will already be set up on a project basis, or the change to a project-oriented company will be easier because the delivery of projects is after all the ‘raison d’être’ of the organization. Programme management in a contracting organization is, therefore, more the coordination of the related or overlapping projects covering such topics as resource management, cost management, and procurement and ensuring conformity with standard company systems and procedures. The cost, time, and performance/quality criteria, therefore, relate more to the obligations of the contractor (apart from performance) than those of the client. The life cycles of projects in a contracting organization usually start after the feasibility study has been carried out and finishes when the project is handed over to the client for the operational phase. There are clearly instances when these lifecycle terminal points occur earlier or later, but a contractor is rarely concerned with whether the strategic or business objectives of the client have been met. 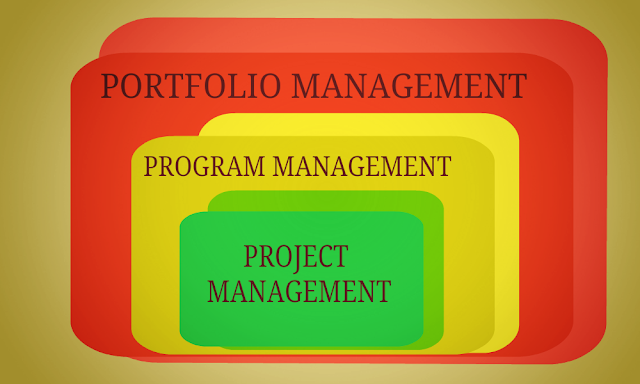 Portfolio management, which can be regarded as a subset of corporate management, is very similar to programme management, but the projects in the programme manager’s portfolio, though not necessarily related, are still required to meet an organization’s objectives. Furthermore, portfolios (unlike projects or programmes) do not necessarily have a defined start and finish date. Indeed portfolios can be regarded as a rolling set of programmes that are monitored in a continuous life cycle from the strategic planning stage to the delivery of the programme. In a large organization a portfolio manager may be in charge of several programme managers, while in a smaller company, he or she may be in direct control of a number of project managers. Portfolio management, therefore, involves the identification of these project attributes and the subsequent analysis, prioritization, balancing, monitoring, and reporting of progress of each project, or in the case of large organizations, each programme. As each project develops, different pressures and resource requirements will occur, often as a result of contractual changes or the need to rectify errors or omissions. Unforeseen environmental issues may require immediate remedial action to comply with health and safety requirements, and there is always the danger of unexpected resignations of key members of one of the project teams. A portfolio manager must therefore possess the ability to reassign resources, both human and material (such as office equipment, construction plant, and bulk materials), in an effective and economical manner, often in emergency or other stressful situations and always taking into account the cost/benefit calculations, the performance and sustainability criteria, and the overall strategic objectives of the organization.